When it comes to my skincare, cleansing is the most important part for me. Because this is the part when you get to really clean your face and wash away that day's make up, leaving you with fresh looking skin. I have quite a basic cleansing routine, but it's one that is really suiting me at the moment so I thought that I would share this with you! This is a very recent purchase of mine which I picked up from my local supermarket. I had been using my Nivea Face Wash for such a long time so I was in desperate need of a change. Because I had been using my Nivea face wash for so long, I knew that I wanted a different brand and thought that I couldn't go wrong with Neutrogena. Once I have washed my face with this, it leaves my skin looking incredibly clean and fresh. I have quite spot prone skin and I'm hoping that this is going to help keep my skin clear. I haven't been using this for long enough to say that it keeps me spot free but I have definitely seen an improvement so far. When it came to using the mask, I thought that it was quite sticky and didn't feel too nice or relaxing on my skin. Anyway I left it on for a couple of minutes as instructed, and when it came to washing this off - it really wasn't that easy. And the end result... I didn't really see any difference if I'm being completely honest. I have never used a face mask before so I wasn't sure if this was meant to feel sticky on my skin and also be difficult to wash off, what have you experienced with good face masks? You might be thinking 'what?!' or was that just me? Well if you are, it's a facial scrub! Now I love a good face scrub, so when I got this for my birthday along with a couple of other Aveda bits I was pretty much over the moon. I have always wanted to try some Aveda products but they are kinda out of my price range so I was super suppppeeerrr excited for this. The packaging says that this is a twice-weekly scrub, so I do exactly what it says and use this twice a week. I like to use this in the morning when my skin is already clean from make up as I find that scrubs work a lot better that way, because then it can actually work into the skin itself instead of any make up. And I have to say that I really, really like this scrub. You literally need a pea-sized amount and that's enough to scrub your entire face with so this will be lasting me for quite a long time which is a definite bonus, especially when it's a twice-weekly product as well. I definitely would not use this more than twice a week however, because it is quite a harsh scrub and you would probably end up hurting or damaging your skin. But because this is quite harsh, it is really good because it literally takes away any dry skin that you have and leaves you with a really soft and smooth complexion that feels amazing straight away. 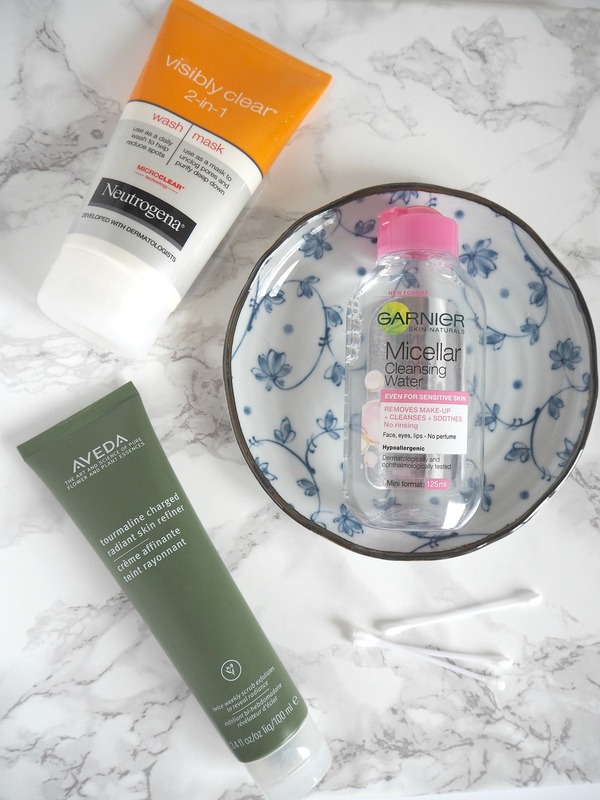 This is the final stage of my cleaning routine, and at the moment I am really loving the Garnier Micellar Cleansing Water. I use this last because it wipes off any make up that has been left behind after washing my face leaving me with really clean skin ready for the next day. You could also add this into your morning routine if you wanted to, as it is super refreshing. I simply put a few drops of this onto a cotton pad, and wipe this all over my face, making sure that I get in the creases of my nose and in my hair line. Once I've done that, I love seeing the make up on the cotton pad that I've wiped off because it makes you realise that this extra step is definitely worth the effort in order to make sure that your skin is completely clean. Since I added in this into my skincare routine (which is only recently), I have noticed a definite improvement in my skin in terms of looking fresher/cleaner and keeping away blemishes.